I heard the Chairman of Petsmart speak at a press conference this week. He said, “Folks, these are not tough times. This is the new normal.” With uncharacteristic pessimism but dependable pragmatism, I picked up my blackberry and tweeted his comment to my followers. Yes Phil, I think you might be right. Now what do we do about it? While referencing farming, I think Amy’s statement is demonstrative of a greater public sentiment – a public that wants to feel safer. In my day to day activities, I’m not setting up a farmer’s market or tilling my acreage but I am working to make more intentional purchases. My money – with a credit union that is based locally. Going to the movies – we have locally owned theatres that I choose. Dinner – sitting in the dining room of a local entrepreneur chef. My spending isn’t all local but I’m working to shift more of my dollars into my local economy. A recent study from Grand Rapids, MI, that examined spending patterns determined that if all 600,000 residents of Grand Rapids simply shifted 10% of their spending from national to local businesses, the result would be 1600 new jobs, an additional $130 million invested in the local economy and an increase of $50 million in local wages within one year. That’s in part due to the fact that those local businesses pay taxes and are more likely to also use local services than their national counterparts. Local spending isn’t the silver bullet but in conjunction with deliberate strategies to improve our education system and increase base industry, it has the power to take us beyond our new normal. And it makes me feel safer. Where can you shift your spending so that more of your dollars stay in your local economy? If we all stop shopping at Walmart, we can shift money out of the Waltons pockets and into more deserving local businesses. What a great link – the high cost of the low price. How true – especially where our food is concerned! Tammy … several months ago you adjusted my attitude to switch just 10%, but we’ve done greater than that. We’ve switched 75%, with nearly 90% when it comes to local restaurants. And after watching Food, Inc., we have now changed our diets, and will soon, after our local move, join a CSA, and switch banking to a local credit union. Thank you for raising our awareness and championing local economics … not to mention, helping us improve our health and well being! Congrats Kathleen! What important work you are doing through your intentional spending. Looking forward to hearing about your CSA. I think this is the normal allows us to stop and sit still and do nothing. I think our new normal can improve daily. I can’t find your bio here but am assuming you live in AZ? Also you quote a study in Grand Rapids and that’s where I spent my life up until moving to AZ 3 years ago. It’s a small world, indeed. Everyday small changes can make the world a better place. Together our small changes get the ball going and eventually snow balling. Great post and very inspirational! Thanks Tess. Yes, I’m here in AZ, the home of Petsmart and Local First AZ. We are going to publicize something called the 10% shift in the very near future. I agree that the new normal will focus us on what we need vs. what we want. What struck me hardest about the video is how HAPPY the people are! They are content and that is not something you can say about every one. My husband and I have a very small veggie garden and there is a unexplainable joy that comes from digging in the soil, putting in plants and watching them grow. There is also a satisfaction to harvesting your own veggies – from plant to plate in a matter of minutes. I wish everyone could experience that. Yes, it is work but oh so worth it! It’s true that they seem so happy – so unencumbered with nonsense. I’m really looking forward to seeing this film. Great article. And really excellent points. In addition to shopping at my local farmers market and supporting locally owned stores, I also make sure to buy gifts for friends and family from local crafters. I think this new normal has been, and will continue to be a way to encourage everyone to spend more consciously. What a wonderful article Tammy! Although I have always tried to buy as locally as I can, you have encouraged me to go even further. One thing we did growing up when we traveled (by Jeep and trailer back in the 70’s) was to find those little mom and pop restaurants in the small towns. No stopping at McDonald’s or other chain restaurants. Of course, some places were a bomb–bad service or food–but for the most part, we had a great experience as we chatted with the locals. We would find out the gems of their area to visit and go off the beaten tourist path. Keep up the wonderful blogging, Tammy. I enjoy reading your well-written blogs and inspiration for always improving ourselves one step at a time. Thank you! I’ve found that one thing the internet is great for is for passing along local favorites via sites like yelp. Of course recipes is the other great use but you knew that! Thanks for reading Lisa. Thanks Tammy for the article. I was searching for some ideas for a meeting that I needed to kick off this morning – with a group of folks who have endured a recent downsizing in staff. It was almost a sigh (not sure I can explain) of relief to accept the challenges we are facing as the norm, because then it allowed me in thought process to move on to, ‘okay, what’s next?’. I love the thought Amy Courtney shared in doing what she can do to feel a bit safer. The what’s next, allowed me to challenge myself and those in front of me, with what can we do? You have opened my eyes to my local community and how do I contribute or support. You have also provided me with thought provoking ideas to share with my teams. Thanks. I hope your meeting went well Cen and am happy that you got some ideas here! Great thoughts and I agree with you that the ultimate benefit is an awareness increase in just how we are spending. Keep us posted on your CSA! What great advice! And thanks for the plug for local businesses. My husband is self-employed and he’s the one that taught me about supporting other locally owned businesses. I’d never really thought about it before but now we actually try to avoid the big chains to support others like us. Thanks for the comment. 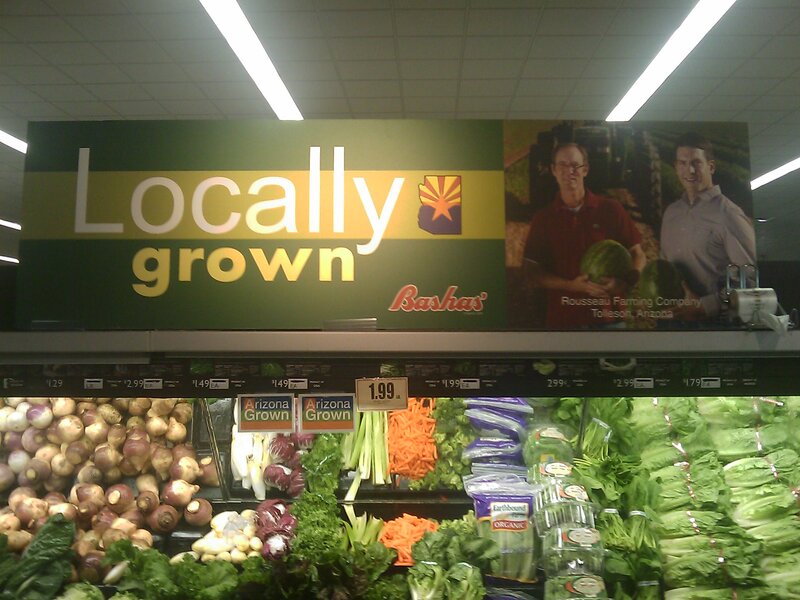 I read another great post about being local on localrootsfarm.wordpress.com. The author gave really authentic and tangible examples of local purchase cycles. I do agree with supporting local as much as you can, the challenge is if local costs so much more than everywhere else and you are on a budget, I am speaking of things like printing, shoes, clothing – but you do raise a lot of interesting points. it sounds like you’ve raised an interesting question about where and how far your food travels. As for all spending, I agree that it can’t all be local but I do think it’s important to do what we can. Here in AZ we have one large unnamed chain store that many people frequent. What they did was to mark local goods on their shelves so that if people wanted to buy something local, they could. And there’s research that shows that people here would rather buy local produce. Great reminder Tammy! I hope that the “new normal” means that we will think more carefully about purchases in general and how “disposable” everything has gotten. Focusing on buying what we actually need vs. more stuff. It shocked me to learn that the U.S. economy is 70% consumer driven. I hadn’t heard the 70% number before. Hmmm – need to contemplate that. If we focus on needs, our paradigms and our spending habits would be wildly different. Thanks for the nice comment. Keep up the good work. And the same to you Jason! I am going to make your blog page on “the new normal” available to the readers of our Adirondack Green Circle blog. In this small mountain community, we are finding ways to become more self-sufficient. For us , that includes promoting the farmers’ markets, supporting regional year-round food cooperatives, getting a community store off the ground, and educating ourselves about our options. And it looks like Normal will be pretty great. What a great community! I hope you’ll keep me posted throughout the year on how things work out for you. And I appreciate your support of my blog! Thanks for reminding me about this documentary. I’m so eager for it to be released. In the mean time, you’re right; we, as individuals, have so much power to bring about change. You and your readers have listed so many good things. There’s not much to add, other than sharing our passion for making a better world with our friends and neighbors. It really does make a difference. I think that quote applies to all of our choices as consumers not just food. Thanks again for making us think. What a great point you raise. The Japanese call CSA – teikei – which translates literally to putting a face on your food. Then food becomes about relationship. Great idea for a future blog post! This is a great article, Tammy. I think it’s important that we all work towards a goal in small, realistic steps. That’s what makes a big difference. Great statistic from Grand Rapids, MI! Small realistic steps is what I like about the grand rapids study. Making a 10% shift is doable. We just need more information. Nice post! I definitely purchase local whenever I can, and make a point of dining at individually-owned restaurants. I like to think of it as “voting with my wallet.” It may not be much day-to-day, but every little bit helps! Tammy, thank you for reminding me that buying “local” isn’t just about food but other products as well. We too have some locally owned theatres to which I will switch my patronage. Local isn’t the answer to everything but it does have the capacity to strengthen communities and that’s important right now. Thanks for stopping by from Madrid. I look forward to hearing about your work on Transition Cities.